How To Make A Terrarium For Kids | Make A Terrarium! Looking for a fun activity to do with the kids this weekend? How bout helping them make their own miniature garden. Kids love picking out plants and figurines to create their own tiny world, and get to learn about caring for plants at the same time. First, choose a container for your terrarium. Glass works well, but clear plastic may be better suited for younger children. Fish bowls, cookie jars, jelly jars, soda bottles, or even small dishes make great terrarium containers. You can choose a container with or without a lid- both make great kids terrariums. Next, let your kids pick out some plants for the terrarium. You can take them to a nursery, or just dig some up outside. If you decide to dig them up, make sure to get a few inches of the plant's root system. You can also start from seeds, which is a great way for kids to learn about the plant's lifecycle. Air plants , African violets , miniature ferns , mondo grass , baby's tears , and club moss are all great, easy to care for terrarium plants. Carnivorous plants require a little more skill to grow, but are always a huge hit with kids. Now that you've picked out your plants and container, you're ready to get to work! 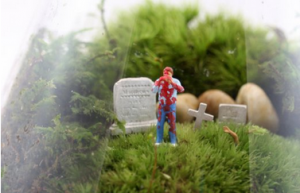 Terrarium building can be messy, so make them outside if you can. Start by adding an inch or two of gravel or pebbles to the bottom of the container. This creates a place for excess water to drain, which keeps the soil from getting too wet. You can use pebbles from outside, or buy some colorful aquarium gravel to add some fun to the terrarium. Next, remove each plant from it's container. Break up the root ball a little bit, and place it in the container. Once all the plants are in place, fill the space around them with potting soil. Add toys to create a fun scene, like this awesome Zombiearium! Now comes the fun part! Have your kids arrange any decorations they want amongst the plants. Plastic toys like monkeys, G.I. 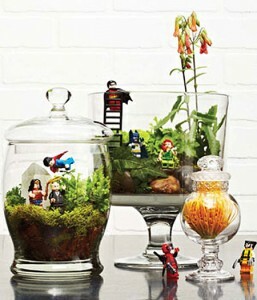 Joe's, Legos, and Hot Wheels cars make fun additions to a terrarium. They can also use pine cones, shells, and small rocks to complete the scene. Caring for a terrarium is a great way to teach kids responsibility and make them feel important. Place the terrarium in bright, indirect light. Don't overwater it- let the soil dry between waterings. Using a spray bottle to water is a good way to prevent overwatering. Now your kids have a fun decoration for their room, and a great way to learn about plants. Enjoy!